Impressing your friends in the kitchen can be hard—but it doesn’t have to be. And what better time to celebrate with food and friends than the explosive culmination of football season? Whether you’re cheering on the Eagles or Patriots, there’s time to whip up a little something extra that everyone will be a fan of. With a little help from The Essential Baking Company and other local ingredients, those buffalo wings you’ve had in your freezer since 2015 will weep. Mix one chopped garlic clove with one tablespoon of EVOO, and spread it over the crust. 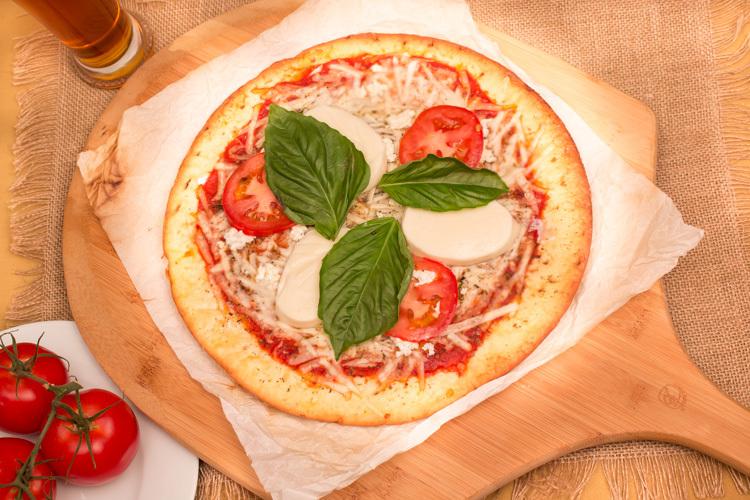 Spread the tomato puree, then arrange sliced basil leaves, tomato and mozzarella to your liking. Season the pizza with salt, pepper and red pepper flakes (if desired). Drizzle with remaining EVOO and sprinkle with remaining chopped garlic. Bake the pizza for about 10-12 minutes or until the crust edges are a pale golden brown. Sit back, and watch your friends swoon. Now, that’s a touchdown. Mix one chopped garlic clove with one tablespoon of EVOO, and spread it over the crust. Spread the tomato sauce on top, and arrange the cheese, sausage, peppers, olives and onions to your liking. Drizzle the remaining EVOO on top and sprinkle with remaining garlic. Season the pizza with salt and pepper as desired. Bake the pizza for about 10-12 minutes or until the crust edges are a pale golden brown. Dig in, take a slice and repeat. Even if your team doesn’t win, your taste buds will.